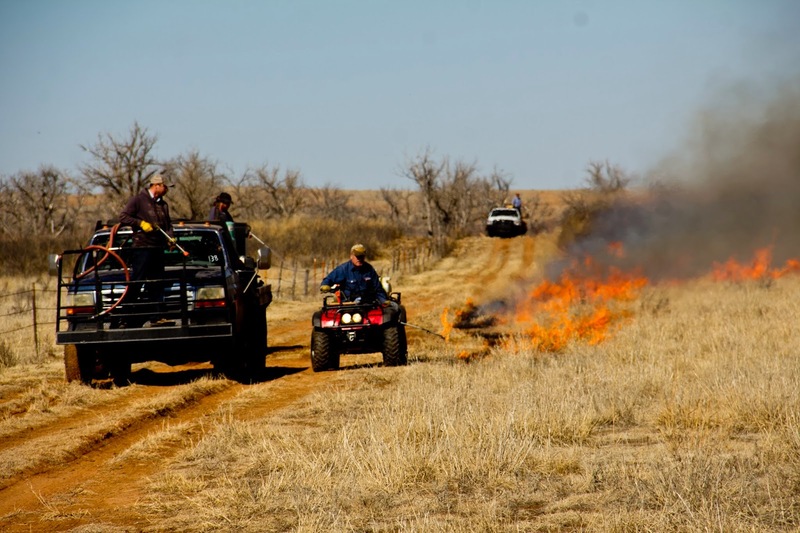 Prescribed burn season is fast approaching. A relatively early burn in the Red Hills started things off. 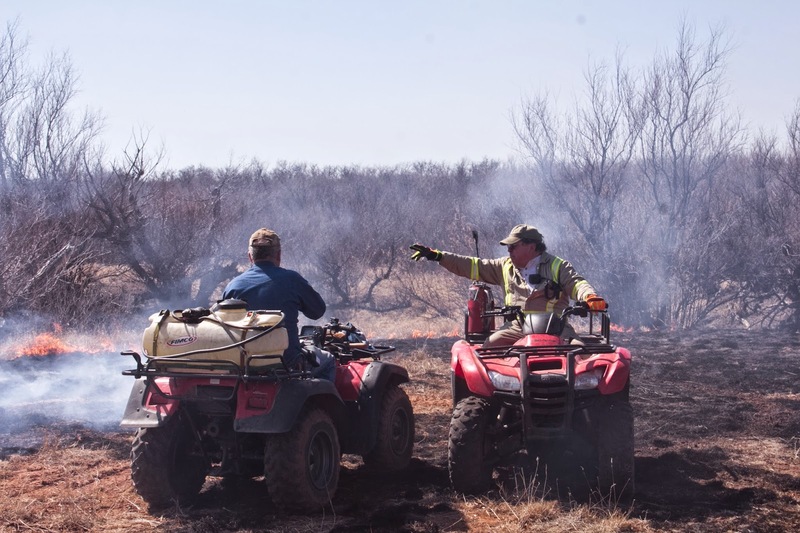 The "Barby" burn was planned early in order to beat the green up of some cool season grasses to improve the effectiveness of the fire. A main goal was to try to finish killing as much of the salt cedar in the bottom land as possible. Improvement in the warm season grasses and available forage for cattle is expected and it will improve conditions for wildlife. 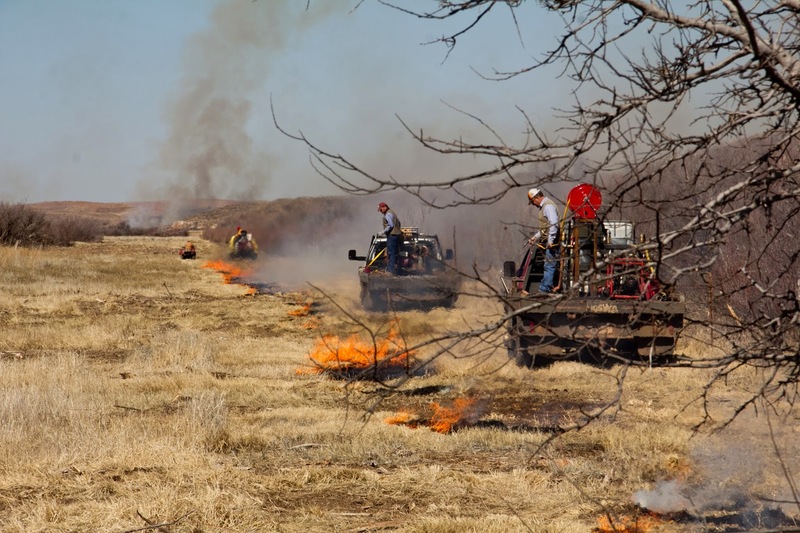 The images take you through the process of a prescribed burn. Keith (in the burgundy shirt in the middle) is the Fire Boss and goes over the burn plan assigning everyone their respective duties. Everyone fills their sprayer tanks and goes over last minute plans and conditions. Brian tests the drone which will be handy in observing the burn from up high. The first ignition is a test fire. If the fire behaves as expected, the burn begins. The landowner, Bill Barby in the black cowboy hat, strikes the first match. The backburn is ignited on the downwind side. Plenty of water sprayers are available to make sure the fire stays on the right side of the fire break. Once a sufficient amount of black from the backburn is allowed, the headfire is ignited from the upwind side. You can see the adequately mowed fire guard and the water trucks laying down a wetline so that the fire goes with the wind and doesn't creep backwards. Jess is using a drip torch to string the head fire. As the other igniter, Ted gives some instructions. 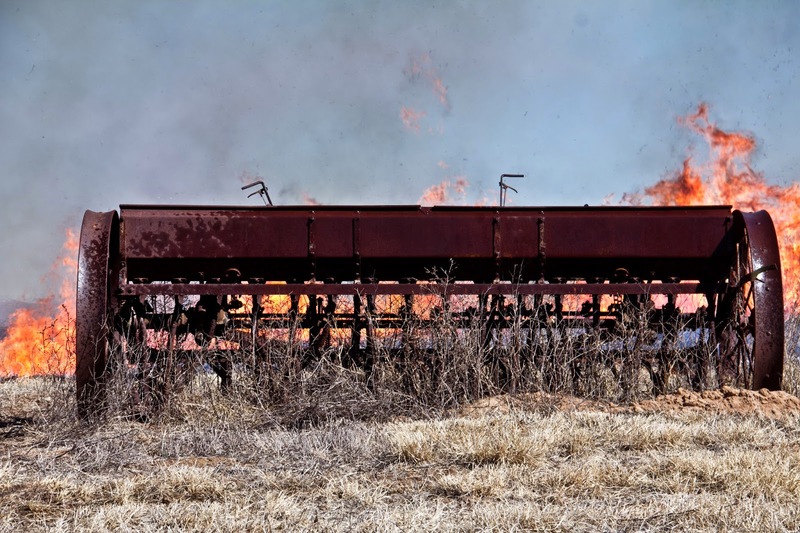 Sometimes, old pieces of equipment can be a hazard with vehicles trying to maneuver around smoky ground. However, this picturesque old drill sits on the edge of the field and out of the way. The fire roars through salt cedar (Tamarisk) in the river bottomland. The cows all came over to see what the heck was going on. The resulting fire may look ugly but come back in another 6-8 weeks and see how lush the undergrowth is. And hopefully, some or many of the Salt Cedar and some Eastern Red Cedar will be gonners! And the work isn't done yet. The area is patrolled for a day or more to make sure any breakouts or restarts can be extinguished as needed. Photo by Bill Barby.